Humans have two modes. Complacency and panic. I was talking to friends with small children recently and was surprised to hear they had opted to not vaccinate their kids. As is so often the case I’m profoundly ambivalent about these issues in terms of right or wrong. What really interests me is the larger dynamic behind why some things become cultural and political trends at specific times. Here’s my theory about the anti-vaccination movement. When I was still in elementary school back in the early 1970s my family would occasionally visit my Great Uncle Tony and Aunt Hilda – one of my grandmother’s younger brothers and his wife. They had a big happy family with five children and a dozen cousins were always around. I always enjoyed being with them. There was a wall covered in framed family photos and I was intimate with nearly everyone on display. But there was one picture of a pretty young girl that I didn’t recognize. I asked my mom who she was. Her voice lowered. “That’s Sarah,” she said. “Who’s Sarah?” I asked. My mom’s voice lowered a bit more. “She was Uncle Tony and Aunt Hilda’s daughter.” I asked where she was now. Long pause. “Sarah died a long time ago.” I had never heard of anyone so young dying before and was alarmed because in the photo she looked to be about my age. I later learned Sarah died of polio in the early 1950s just a few years before the Salk vaccine became available. The generation that experienced the death – or more commonly the withered limbs and diminished vigor – of infected children grabbed hold of the Salk vaccine with both hands. Quarantines, long hospital stays, and the use of iron lungs to manage the effects of the disease were highly visible. No less a figure than President Franklin Roosevelt had been tormented by the disease in the years preceding the vaccine. There were fits and starts in the beginning as some batches of the vaccine were improperly manufactured and actually infected some children causing a national scandal. So there were, in fact, very real risks associated with the vaccine in its early incarnations. But overall, the immediate fear of the disease itself overwhelmed the potential dangers. 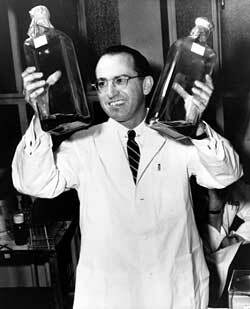 Preventive measures such as Dr. Salk’s vaccine were widely embraced as a miracle of modern science. Even at the height of the Cold War bitter international enemies cooperated to spread the vaccine throughout the world on the logic that no one was truly safe from infection unless the disease was eradicated everywhere. Today only a few small pockets of polio persist in remote corners of Afghanistan and Pakistan. In those regions centuries old fears of invading armies and unscrupulous foreigners (Greeks, Persians, Indians, British, Soviets, Saudis, Americans…) are actually greater than the fear of disease. Today almost no child dies of an infectious disease in the moderately prosperous parts of the world. The diseases that do afflict the population in poorer regions are typically from lack of clean water and proper sanitation. There are tragic cases of non-infectious illnesses such as cancer to be sure, but those aren’t contracted casually the way polio, smallpox, rubella, mumps, measles, and such once were. In a part of the world where almost no one ever sees a child fall victim to these distant illnesses the fear has migrated to the more proximate concern (real or exaggerated) of side effects. Oddly, the multi-decade success of global vaccination programs created the conditions that bred apathy for their effectiveness. The slow pendulum of biology and generational succession will eventually swing back. New threats will emerge and the fear of imminent devastating illness will focus attention on preventive measures. Vague concerns about possible imperfections in any cure will likely be pushed aside. The world is currently a hair’s breadth away from new antibiotic resistant bacterial infections and novel viruses. Fun! I’d like to use this same framework to explain our present global economic and political situation. We had a bad spell of spectacular systemic failures in the 1930s and 1940s. These institutional crashes demonstrated what could go wrong – how very very wrong – if people didn’t cooperate and reach reasonable compromises and remedies. A whole generation was sacrificed solving those problems via war and immiserating loss. Once the dust settled new institutions were created organized around the principles of restraint and cooperation. When cooperation wasn’t fully navigable all sides quietly agreed on an uneasy detente. Another direct full blown war was in no one’s interest. But now new generations have been born and come to positions of authority with no living memory of the great convulsive crises of seventy and eighty years ago. All the safeguards have been dismantled and tossed aside as historical baggage. “It’s different now.” “It’s different here.” Our leaders as well as our disgruntled populations everywhere are looking for a fight. They’re the economic and political anti-vaxxers. What could go wrong? Someone mentioned Nicholas Nassim Taleb. The biggest lesson I drew from his work was the awareness of deep complexity and our inability to model something as complex and multivariate as our technological, political, cultural and socioeconomic world. So everyone just believes what they feel, but the truth is beyond all of us. Who could predict the steam engine, or the silicon chip. And if you can’t predict something new with effects that big, how can you predict anything? That said, what does seem likely, is increased innovation. Add an educated China and India, amongst other places, into the mix and how many new innovations are coming down the pipeline as we speak, building on our ever improving tools. When a problem arises how many educated minds will be available to think of solutions? My bet is on optimism. Finally, a place where I can talk about my vaccination apprehensions anonymously. Anti-vaxxers aren’t just the sort you have pictured in your heads. The stereotype varies from country to country, but I tell you, the “otherwise normal” ones are not few in number. I have many highly educated, critical-minded friends who do not vaccinate their kids. I partially vaccinate mine similar to a schedule I received as a child (ie. much more delayed and leaving out things such as chicken pox, measles, and mumps, which I got–kids who had these during the summer were in high demand, we had to play with them in the back seat of a car to “get it over with” while school was out). But I vaccinated the incurables first, such as polio and tetanus. Having done some academic work around the history of American health policy in their then-colonies, I read a lot of firsthand accounts of early vaccination. The mechanisms of vaccines were pretty straightforward back then. I never gave second thought to vaccinating my kids. I then graduated into working for a nonprofit that dealt with pesticide poisoning. I also have a very close family member whose child I witnessed devolve into something that is currently described as “vaccine injured” and this clearly happened after vaccination. This led me to research into the many online fora in which parents share anecdotes and sagas about their children after modern vaccination. Sure, you think. Anecdotes are not scientifically valid. But there are enough anecdotes to spur anyone scientific to want to evaluate what is really going on. My pediatrician gives full vaccines but does acknowledge that there are adverse reactions which she cannot reverse, and they are increasing. I see a lot of parallelisms between how the pesticide industry and pharmaceutical industry deals with people who dare label their products as unsafe. Like, it’s non-negotiable, let’s not even talk about it. Regulatory bodies need to begin talking about it, nonprofits need to start doing private research. As one policymaker told me, they have to be very careful, because people will throw the baby out with the bathwater and soon it will be acceptable not to vaccinate. This lack of dialogue is creating even more fear, and pushing people further away from vaccines. Measles is highly contagious and you are putting your kids at risk skipping it. Even worse, you are putting those at risk who are unable to be vaccinated such as infants or immune-compromised. So your self-affirming ueber-conscientious choice is false because it increases risk of infection for those who did not make the choice not to be vaccinated. If you are really skipping vaccinations at least never ever go to a foreign country and then come back home. I come from one of those foreign countries that you are referring to. Honestly still on the fence about measles in particular, so I may have my 3 year old vaccinated, as our hospital just got the single shot for it. Johnny, I think you have only scratched the surface of using this topic to explore culture. My personal theory is that there is a crisis in parenting. But not what you might expect. These people are otherwise well equipped financially to get emergency medical care if necessary. They are educated enough to argue with their doctor. They come from the dominant cultural group so they have the cultural capital to resist. I’m part of this group, demographically speaking. So I even feel comfortable saying “we” when describing “our” problems. Here is the crisis in parenting: we can’t deal with risk related to potential harm to our children. We have all the resources in the world to protect our kids. But vaccines present a problem. They have the potential to help protect our kids but there is a one in a million chance they could also harm our kids. For some parents this risk is unacceptable. Many of us have read Taleb and we know that the risk of ruin for the individual should not be ignored and that the “expert class” often conspires to convince us otherwise. This is the same affect of “helicopter parenting”. The parents hover over their little one because there is no amount of harm they can stomach. But the macro affect is that kids become infantilized, stunted, and less adept at managing their own risk assessments and become more prone to calamity as adolescents and adults. This is rational. These anti-Vax parents are thinking about “black swan” events the same way that Taleb does. So this is not a problem that is going to be solved rationally. Parenting, especially today, requires a religious faith to transcend risk. You must confront and expose your children to real risk in order to save them…just like innoculation from vaccines. I respectfully disagree with the assertion that total risk intolerance is somehow “rational”. Total risk intolerance is an emotional reaction, and the exact opposite of rational. Chris B – I think you and I agree about what “good parenting” looks like. However I disagree that good parenting is rational. I think it requires worship of the transcendent. The anti-vaxxers are an expression of rationalism taken to the extreme. Children come with a vulnerability that they risk ruin at nearly every turn. You can vaccinate your children against polio but you have only crossed one or a million possible ruin scenarios off your list. Likewise you can choose not to vaccinate your children and you have eliminated the “ruin by vaccine” scenario (but the infinite other ruin scenarios still remain, especially the horrible diseases). Vaccines or no vaccines don’t solve the problem of childhood ruin. They may be applied to the problem of childhood disease, but not childhood. That is what Taleb is talking about. There are limited problems that rationalism, probability, and risk analysis can solve. Childhood isn’t one of them. I think you need a transcendent structure to navigate childhood. Something like a “culture of the heroic parent”. Parents who dynamically co-create a childhood with their children and partner. They must heroically confront danger and grapple with the reality that adulthood lies on the other side of the chasm of ruin. Faith in the transcendent is not a “risk mitigation” strategy and it does not offer guarantees except of what happens to the faithful at the end of life…which may come at 5 or 95. Again…there is nothing “rational” about responding emotionally to any and every slightly measurable threat to one’s children. Let’s call it what it is: pervasive and consuming anxiety. There are two classes of risk. Ruinous and non-ruinous. Non-ruinous risks are thing like scraped knees and broken wrists (for the sake of argument, in fact these have non-zero chance of ruin for kids too). The domain of the non-ruinous is fine for rational risk assessment. I can accept a 20% chance that my 8 year old will break her wrist this year. In the domain of ruin, rational risk assessment doesn’t work. Parents can not use probability to determine if it is ok to expose their children to a 1 in a million chance their kids will be ruined by a vaccine. This is why Taleb talks about “Black Swans”. These are the incredibly improbable events that have the potential for ruin (i.e. infinite harm). .0000001 x infinite harm = unacceptable chance for ruin. Prior to and during birth your child was exposed to similar levels of risk of ruin. It also happens every time you strap him/her into a carseat, especially at night when the incidence of (other) drunk/drugged drivers on the road is higher. Then when you send him/her off to school, there will be bus/car accident risk and school shooter risk. Everything I mentioned also has an extremely low probability and possible ruinous outcome. In modern life you just can’t avoid or control all such circumstances. Anti-vax has nothing to do with fear of risk. If people were worried about their children getting maimed or killed, they wouldn’t let them ride in automobiles. Anti-vax is about something else. The anti-vaccination crowd is just a left wing side of the anti-science crowd who believe that what they think and learn on YouTube is just as valid as fact. I often compare, in my own head, the progression of behavior and attitudes from the 1930s to now. The other day I came across some funny “27 Things That Moms Did in the 1960s” which would shock us now. They showed, of course, parents smoking in cars with kids inside, no seat belts, and children riding bikes without helmets. Then I thought of “27 Things About Moms in 2019” that could shock people in 2059. I imagine that what we think of as normal today, will seem utterly ignorant and self-destructive half a century from now: 300 lb. moms with tattoos, parents who don’t cook but order takeout every night, staring at Instagram 12 hours a day, homes without a single book in them, and anti-vaxxer parents who fear polio less than the opinions of other parents at the Organic Academy in Berkeley. well your two cents are worth about that. There is no evidence whatsoever in poll after poll that – see Yale, see the Pew Research, see Fordham – the “left” has any more interest in anti-vax than the “right.” Several studies put this as identifying Democrat or Republican, so unless your Republican folks are considered “left” which seems a stretch, the numbers are about equal on both sides. One thing we can all agree on, is the MOST informed individuals including virtually ALL of doctors, nurses and other healthcare professionals like pharmacists – ALL agree that vaccines are highly effective at minor risk and if anything we ought to be launching greater efforts in this area. So you should take your fear of organics and 300 lb moms and go back to school. But I agree with you about the books. Yes the anti vax movement seems to be one half on the granola left and the other half on the bonnet wearing right-wing. Just anecdotal but how it seems to me from what I’ve seen. But from either group, they seem to pack up. Clusters of anti vaxxers at a fundamentalist church or at the lefty organic commune. Increasing risks. ‘”It’s different now'”. No it isn’t – it’s almost 1929 re-engaged, in many ways. True there are some safeguards that didn’t exist back then, but those are fragile and easily dismantled these days by those who are aggressively attempting to do so. And then there’s the apparent current global rise of nationalism, which partially powered and drove the beginnings of WWII. Could easily happen again. As for vaccinations: when I was a kid I had mumps and measles and chicken pox and whooping cough (no vax for that, as far as I know) and got vaccinated anyway, so I don’t see the Big Deal against vaccination – even tho’ I have shown some tendencies toward being on the ‘spectrum’ myself. Later in life I got anti-flu shots and got the flu within a short time following both so I haven’t ventured in that direction since – even tho’ I’ve since been advised that I was probably already infected when I got the shots. Trust and/or lack of it is a funny thing…. Technically I would say we here in 2019 are in a comparable situation to the period of 1935 – 1937. The crash of 1929 had hit hard for a few years. Then the market doubled from ’35 to ’37 and a lot of well positioned folks were able to extract huge gains. Then the market crashed waaaaaaay down again in ’38. The trouble isn’t the stock market per se. It’s the havoc these financial gyrations have on the underlying real economy. That economic havoc then contorts the political process as anxious and angry populations reach out for ever more desperate fixes from increasingly “innovative” leadership. Left. Right. Same same. This is very astute. Extreme reactions and fixes push the system ever more out of balance. We as a society, do seem to be forgetting the lessons of history, hopefully we won’t have to descend into tragedy to remember these lessons as a society. Compromise used to be considered a social and political virtue, we need to think about how to bring that way of thinking back. I’d say the current rise of socialism, which killed by far more people than nationalism in the 20th century, is more likely. Socialism is a religion; it’s tantalizing to those who don’t know history. That’s why it’s called the iron fist in a velvet glove. Although what you’re saying is true in terms of numbers it seems like an academic argument to me, like arguing about who was worse, Stalin or Hitler, when you wouldn’t want to be in the Soviet Union or Germany or anywhere in between. To me the real point is that unskeptical purity of belief in any system is toxic and very dangerous, whether it is the One True religion or political or economic system. It seems like purity of belief always leads to blaming someone else, the others who threaten that system, and they have to pay. Stalin and Mao killed more people because they were in power for a long time in big countries. I wonder how old you need to be to have no memory of what were once common childhood diseases. I had measles and German measles and chickenpox which was pretty normal in the 1950s. I remember the doctor visiting me at home. Somehow I avoided mumps which was once considered a bad thing to have avoided as a child because it was worse to catch it as an adult. I certainly remember kids in school with leg braces. I also recall standing in a long line to receive a polio vaccination in a sugar cube. My own kids caught colds from time to time, but that was it. Of course, they were vaccinated. I doubt that they even know any contemporaries who had any of these once common childhood illnesses. I guess if you were born after 1960 all this must sound very foreign. The recent widely reported illness of a child with tetanus because his parents refused the vaccine should be a wake-up call to anti-vaxxers. That horrific illness which few survive was tamed by days in hospital with thousands of dollars spent (a cost shared by all insured). A cheap, simple shot … all could have been avoided. I know some “very nice” people who are anti-vaxxers, and they are wrong. Their children and the community are their victims. Kuntsler has been banging the debt theme of late, and for good reason. (And seems to have backed off Peak Oil that has been his bread and butter for a generation.) I think even he’s beginning to realize that while Peak Oil is far enough in the out years that the clock won’t strike twelve during his personally allotted time here, Debt Tsunami probably will. Personally I can recall only one person with polio – my grade school principal’s admin. assistant. She was probably 50-ish at the time, and if she had to get up from her chair had these metal braces that went around her wrists that she could lean on….not unlike FDR’s I guess. Though that did get me to thinking……in the late 60s and early 70s you could run a Catholic grammar school with @ 800 students, Grades 1-8, on (1) Principal, (1) Admin Assistant, (2) Custodians (who handled the church and rectory as well), (16) teachers (two classes in each grade), plus a couple part time assistants for the early (1st and 2nd) grades. Volunteer church ladies fixed up hot dogs on Thursdays in the multi-purpose room; other than that you brought lunch from home. 8th grade girls ran the “bookstore” , where you mostly bought Pee-Chee folders. That was the entire staffing infrastructure. Pretty bare-bones, perhaps, but it worked. Now consider again “Debt Tsunami”, above, and how that’s all come to pass. There will eventually come a point when marginal supplies of low quality hard-to-reach oil will be tantamount to “running out” in terms of a physical return-on-investment. When will that happen? Who knows… I’ll be dead. But the popping of the debt bubble is likely much closer. Not tomorrow. But not never. I expect governments to inflate their way out of their debts by competitive devaluation of their currencies. The trick is to chip away at the currency gradually enough that people don’t notice. But that’s a genie you can’t put back in the lamp when it slips out of control. In the end all money will be reset and re-issued under new parameters. But that’s some ways off. Between now and then? Weeeeeeeeeeeeee. It won’t be the end of THE world. But it might be the end of YOUR world. What is marginal, hard to reach oil, however, changes with advances in technology. What circa 1900 Texas wildcatter would have considered deep sea drilling to be economical? To a great extent, fracking is used to recover oil and gas that was once considered to be uneconomical. The final boundary will be set by energy, not money. A standard unit, a barrel of oil, has 1700 kWh of energy, and when the amount of energy needed to extract a barrel of oil approaches or exceeds this 1700 kWh limit, oil extraction will have become infeasible. Yes. Unfortunately that fact (based on physics) doesn’t sit well with our collective hopes and dreams. So we ignore it. No, it’ll be set by money. If you can extract and sell and make a satisfactory profit, it will be worths someone’s time and money to do so. With new technologies, the energy required to extract can be pushed downward. Or at least, it has been pushed down for years. This is a game I call Depletion Doomers Vs. Techno Utopians. Both sides are right. And both are wrong. Reality is in the middle. There’s a finite amount of hydrocarbons in the Earth’s crust so natural limits really do exist. We’ve been using the best quality easiest to reach and refine stuff for the last hundred and fifty years with an ever increasing consumption rate. From here on out it’s the heavier, dirtier, poorer quality, harder to get stuff. But that natural supply is enormous. New technology absolutely has – and will continue – to bring new supplies to market. There’s a really long production tail that will stretch out for the next century or two. And while new extraction techniques bring new supply, new technologies will also substantially increase efficiency and reduce consumption for the same unit of desired economic activity. So what we’re headed for is the moment when the diminishing returns on tech extraction and hyper efficiency converge with natural limits. The thing that makes the tech and efficiency stuff possible is finance. You can’t build super complex ultra deep water oil rigs or heavy sour tar sands and shale oil processing plants without huge upfront capital investments. If that money isn’t available for new equipment and talent the extraction grinds to a halt – regardless of the resource that might still exist. Why wouldn’t the financing exist so long as the financial projections appeared feasible? Why wasn’t investment capital available in 2008? Why isn’t investment capital available in Venezuela right now? Why wasn’t investment capital available in Russian in the early 1990s? Risk was too great for any potential awards. As confidence in a situation increases the capital becomes available. In the US, generally, within a couple of years. In Venezuela? Not so long as the current government is there, and then some. Yup, most investments are based on projections about how they will pan out, and as the old joke goes, forecasting is tricky, especially about the future. It’s not unusual for things not to pan out. “The final boundary will be set by energy”. No. Hydrocarbons are not just energy: they are primary foodstuffs for the huge chemical industry and largely irreplaceable for that. Thus it can make sense to keep extracting oil even at negative ROE. I agree that hydrocarbons can be endlessly extracted at a financial loss provided enough debt and/or subsidies are available. Lots of commodities are sold for less than the cost of production. Grain for example. Here’s where we differ. I think every aspect of our modern economy is currently underwritten by cheap and abundant energy – almost all of it from hydrocarbons. Expecting the subsidized ecomomy to subsidize fuels won’t work. It’s curious that Orca says Kunstler won’t see the clock strike 12 in his lifetime and your own comment Johnny “I’ll be dead,” which both constitute their own form of denial. Even while you accurately assess pieces of the energy conundrum elsewhere. Meanwhile much of your site is dedicated to chronicling the decline. I’d argue the clock is striking – it’s just not, and never will be, one single chime. As to Kunstler, there’s little he’s gotten right tbh but he’s still damn funny to read. I’m fifty one. The men in my family live to be about seventy five. Will the world “run out” of oil in the next twenty odd years? Meh. I see shortages and bottlenecks due to geopolitics and economic crunches. Americans in particular might have to use substantially less oil for all sorts of reasons. But that’s a different animal. They aren’t mutually exclusive. I’m in about the same place as Johnny. I could live 10, 20, or 30, or more years. And I agree with the techno and efficiency hypotheses extending the life span of fossil fuels. As a result I’m also about 99 percent sure we won’t run out of hydrocarbons in my lifetime. We have to consider natural gas and coal too; I’d suggest the minute dirty coal becomes cheaper than NG, we’ll fire back up the coal boilers for electricity and resume tearing up the landscapes of the Ohio Valley states (West Virginia, Kentucky, Ohio, Pennsylvania, Indiana, and Illinois) even worse than fracking does. With the trajectory renewables are on, and as cheap as natural gas is, I’ll be surprised if coal can become cheap enough to make financial sense except in very limited circumstances. Or it might just be my wishful thinking. CO2 and particulates are bad stuff. Natural gas is currently underpriced relative to the cost of production. It’s basically a byproduct of other extractive and refining processes. Those primary supply chains are also running mostly on past investment models that aren’t necessarily cash flowing properly and there’s a great deal of debt in the industry. The price of all fuels can and likely will change over time – quite possibly driven by geopolitics. It’s possible coal can come back as the cheapest fuel – and we might be desperate enough to keep burning more of it. Renewables (solar, wind, hydro) and nuclear generate electricity not liquid fuels. Electricity is about 20% of the energy consumption pie. Transitioning all the cars and truck and furnaces to electricity created with renewables is a multi-decade process and probably doesn’t scale if we expect to maintain the same habits we have today. Commercial aviation, for example, simply can’t work on anything other than liquid fuels. And there’s the problem of keeping buildings in Minneapolis and Saskatoon warm in the dark trimester without radically retrofitting them in al sorts of other ways which are unlikely. You know the natgas market is topsy-turvy when they flare it at the well and even right-wing and oil-friendly states are considering legislation to curb the practice. When people launched into WW2, the memory of WW1 was relatively fresh in those people’s minds. I would say if people have a reasonable income so they can comfortably feed, shelter and educate their family, they have zero desire to go to war, unless they are attacked by invaders. WWII was a continuation of the unresolved structural problems left over from WWI. In the same way the bubble economy of the 1920s and the crash and Great Depression of the 1930s were all part of the same unresolved economic transition away from agriculture and into industry. The money troubles created the conditions for domestic unrest and foreign military adventurism. It all unfolded in stages. The fact that it was a double whammy and included the Bolshevik Revolution and Nazism really impressed the folks who restructured the world beginning in 1945. What I see coming is a similar series of fits and starts that will play out over decades as the world tries (often unsuccessfully) to resolve the challenges of the twenty first century. It doesn’t have to involve war, but it won’t all be fun. I agree, the long term future is not rosy. Our civilisation has reversed natural selection and our mental and physical health will decline with each generation. 99% of people will hate me for suggesting that. And no, I firmly believe that something like eugenics will never work, for many reasons. I doubt that technology advance will save us from decline either. I have no solution, but I just cannot believe that our future is a steady improvement. Natural selection is a funny business. The creatures that survive, breed, and persevere aren’t the perfect ones. Instead they’re often the most flexible – with a touch of freaky mutation and a bit of right place, right time luck. Any specially organized Master Race would fail pretty quickly from some unforeseen twist of fate. Mutts are always the building blocks of the future. The future could be grim. It could also be pretty great. I strongly suspect it will be both. Depends on who you are. And where you are. Right place. Right time. Luck. The future will be what it will be. Some will do well; some will be abused by it. I tend to think that greater and greater numbers will be abused, although I see the abuse in the form of social and economic denials and punishments in the name of conformity. This is already happening in spades. It’s interesting that Eugenics was mentioned. The actual goals of the original eugenics movement have already been reached in society, just not under that label. Even though the label is despised, that particular movement enjoys amazing success and acceptance in current society. Globalism is the (current) driver of our destruction. It is the Nazi/Bolshevik revolution of the current century; all about power and control. That it is dressed up under such common catch-phrases as “autonomy” and “equality” is essentially putting lipstick on a pig (or wolf, which might be a better illustration). It’s intolerance of any opposing view(s), ironically while it preaches tolerance, is pretty epic on a historical scale. It’s the new shape of tyranny; and everyone is on board! The only thing I really disagree with, concerning your post, is the nature of the people controlling the vaccines. The history of the vaccines themselves is filled with altruism; there’s no denying that. But much of that altruism has disappeared and it seems vaccines are now less about saving the human race and more about the bottom line, money and control. Most anti-vaxxers are far more concerned about who is making the vaccine and their goals than anything else. The corporate and political elite are no longer considered an altruistic bunch, with good reason. For the record, I am not an anti-vaxxer although I would say I’m “undecided” on current vaccines. I haven’t had a flu shot in decades. I am old enough to remember having the chicken pox in my 20s and standing in line for shots in the public schools.